One aspect of living in a Hello Kitty Hell is that Hello Kitty fanatics don’t think like normal people. Their minds get so obsessed with Hello Kitty that the main object of anything suggested gets turned around from what has been suggested to Hello Kitty. me: I’d like to plan an overseas trip. Where would you like to go? wife: Oh, I don’t care. Any place is fine. me: I was thinking about South America. Maybe Argentina. me: How about someplace in Africa. I’d really like to see the wildlife there. me: How about Russia? I’ve always thought that would be a great place to visit. me: I thought you said that any place was fine. That you didn’t care. wife: I don’t as long as we can travel on this plane (takes me to her computer to show me the below photo) and it doesn’t go to those places. Worst of all? Even the food is Hello Kitty. Now why is it when terrorists blow up planes, they never have the decency to blow up the planes that would be a service to the world? Just want to let you know, if you want to tell your wife, this Hello Kitty plane just fly from Taiwan/Taipei to Japan, Tokyo and Fukuoka, so Hello Kitty fans can go to Puroland and Harmonyland respectively. Does your wife really love Hello Kitty? Because all Hello Kitty fan knows about this. BTW, I am a real Hello Kitty fanatic. But I like your website. Thank you. OMG, you are so lucky. I am totally envious! I don’t know if that’s noodles or green beans, but if that’s colored HK butter… my stomach is churning. If it’s not butter… then I will be sick. I got a few sets of fake mini Hello Kitty food about a year ago… just look for Hello Kitty Takara on eBay! talk about hello kitty service!! i would soooo go there! i would love to be on that plane! all my friends would definitely have all the laughs! i wish i could go to sanrio puroland with that plane! WOW!!!! WOW WOW WOW! I wanna go there too!!!! Posted 2 Hello Kitty Photos. Hello Kitty is Soooo…. CUTE. How can you people be so mean. it’s just an innocent toy. plz respect it anyeay.. ILY HELLO KITTYY!! MWA xoxoxoxoxo. ILY!! HelloKittyLova said: “itâ€™s just an innocent toy. plz respect it anyeay.. ” NO! itÂ´s not just an inoccent toy.. Its a freaking bath-tube, toilet, toaster and finding a pink tent with a big hellokitty face on it wouldnt surprise me.. I dont hate hellokitty but to you who live in hk hell think of the tent as something useless, just a few drops of rain on it will make you wet. But i havent seen such a tent yet :D..
And sorry for bad spelling/english I’m from sweden and we talk swedish. My one carry-on bag would be full of either little debbies and diet cokes, or something else that will last for two plane trips. As well as a lock to keep the wife from furiously ripping the bag open and doing a hello kitty stomp dance on your edibles. I think your wife and I could become best friends as I too am very crazy about HELLO KITTY ^-^ My husband and I didn’t have a wedding ceremony we just went to the court house so on our 1year anniversary we are planning on having a ceremony so I want it to be HELLO KITTY ^-^ I think my husband is also living in a HELLO KITTY ^-^ hell (hes going crazy). We read the blog about the linux and the first words that came out of his mouth was NOOOOOOOOOOOOOOOOOOOO!!!!!!!!!!!!!!!!!!!!!!!!!!!!!!!!!! So I gave him the puppy dog face and said please so I think I talk him in to it……………..hopefully =) But as I say I just can’t help it shes so CUTE!!!!!!!! And I’m still surprised at all the HELLO KITTY ^-^ stuff they have. But he says he supports me so ill have to believe him. my friend loves hello kitty. 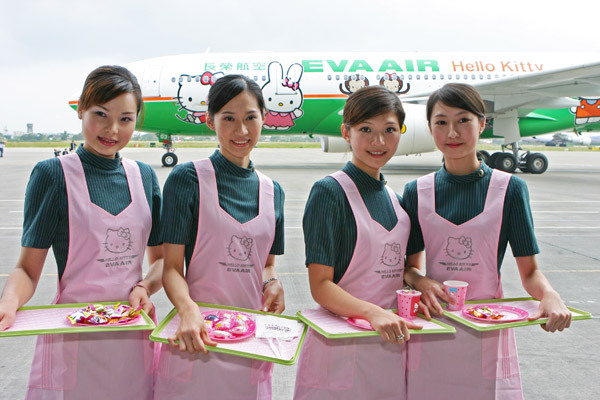 I take Eva Air all the time and my food is never in the shape of Hello Kitty. Must be in business class?? i love hello kitty i always wanted to ride on that plane my wish is to do that and meat hello kitty i just wish please email me back. wooow. for some reason. i think the plane would fall apart mid-air. something about hello kitty never really screamed ‘top quality’ at me. like the food. there’s probably lead in it. or something else to kill you while they make mad money. MAD money. I would love to go on a trip in the HK plane. i love HK. She is so cute and just makes you smile!!!! I fly with Eva Air in September then i ‘ll tell you. I hope that this company is great because hello kitty bring only right way. I heard from Eva crew that their contract with Sanrio ends at the end of 2008. HOW DARE YOU SAY THAT ABOUT HELLO KITTY!!!!!!!!!!!!!!!!!!!!!!!!!!!!!!!!!! That plane is B/A!!!!!! you are a kitty hating, puppy kicking, meanie!!! lol your wife is awesome!!!!! i want to go x !!!! Foul foul foul foul!!! I should bring my aunt to one of these so she can barf non stop in it! One aspect of your hell will end, EVA will end it Sanrio promotion and take the jest out id service starting in December 2008. I’ve flown EVA Air. It’s actually a great airline, better than American Airlines, Delta, etc. Hello Kittified or not (because not all of their planes are like this) the food is pretty good, they still give you pillows, blankets, hot towel, etc. And the stewardesses are actually really friendly. i m just a small girl from singapore, but it is ot an offence to like hello kitty right? by the way, the name”hello kitty hell” sounds scary u know!!! people will thing hello kitty as an evil thing!!!! u people r just evil!!!!!!!!!!! im so young and i already know how to appreciate things. but u adults. . . . .sigh. 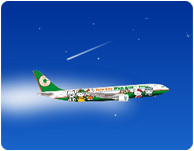 . . . . . .
Eva and Sanrio has ended the program, both planes have been taken out of service. 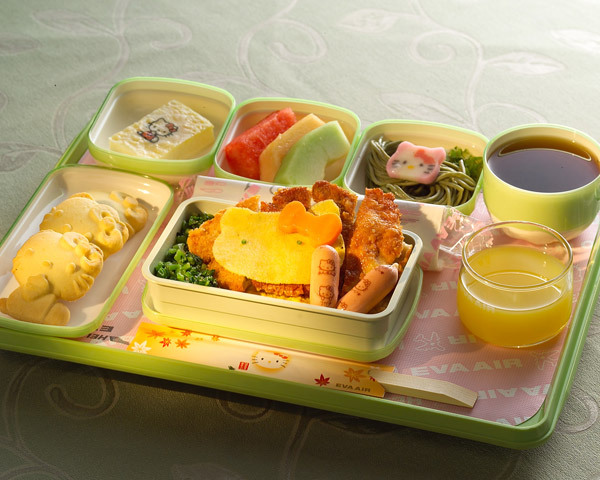 if you REALLY like hello kitty, will you want to eat food in shape of them?? Did it occur to you that you could’ve told your wife that you DIDN’T agree on going to Taiwan? I was passing thru the Taiwan airport and there is a Hello Kitty gate. You don’t actually board a plane there, but it is right next to the Hello Kitty store. I guess I am not a real Hello Kitty fan because I did not know this place existed. In googling for more information, I discovered that there is a hospital in Taiwan with a Hello Kitty maternity ward. Did you know this? Has your wife had a baby yet? Urm, i am thinking I can guess where she will want to deliver. Man, this is the most wtfesque thing I´ve ever seen. My sympathies are with you. I dont know why I like her as a child. She slowly started to get to me now I totally hate her. and my friend has hello kitty everywhere and the walls are all pink I want to die everytime I walk in or sleep in hello kitty blankets. Um I’d have to drag my friends along just so I could watch all the insecure people freak out. Awww yeah would be good times and I don’t really like HK but this just looks so ridiculous its great. Kinda can’t decide if I’d go in standard goth/nu-metal style just to freak out all the pink wearing people. :O Plus I’ve always wanted to see Matsumoto castle anyway and eat some good sushi. This reminds me of another plane that is Pokemon themed. These planes really do appeal to the die hard of fans. 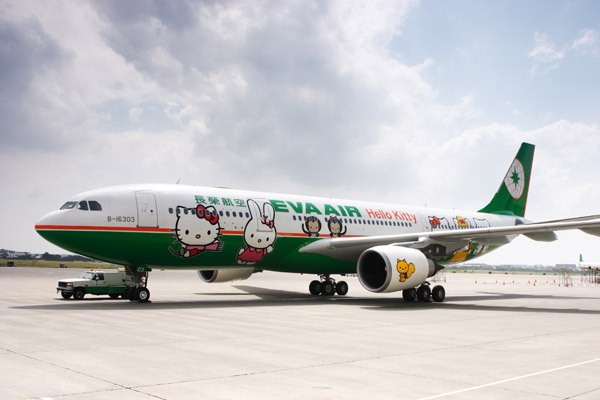 However, I am still tempted to see how far can they customize the plane to suit Hello Kitty. wah sieh!!! so good…. i am going on june 3…. so far,i had only seated a few normal aeeroplanes!!!! NOT like this so good.. all hello kitty things..